Valletta FC 1945-46 champions. 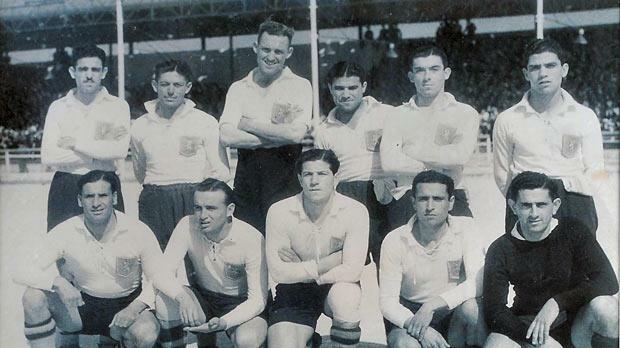 Back row (left to right Walter Bezzina, Ġużi Formosa, Sam Rodgers, Ġużi Mallia, Pawlu Vassallo, Salvinu Schembri. Front row: Ġużi Demicoli, Ġużi Buttigieg, Leli Curmi, Victor Bonello, Joseph Spiteri. On Sunday, November 5, 1945 Valletta opened the defence of their league title with a 7-0 victory over Msida St Joseph FC. Salvinu Schembri, who had just joined the Citizens from Sliema Wanderers, celebrated his debut with four goals. The following Saturday, Sliema beat a very poor St George’s team 4-1 while Hibernians surprisingly lost 0-1 to Melita. The derby between Floriana and Valletta lacked frills but it more than made up for it in thrills. The game had hardly started when Gejtu Sacco fired Floriana ahead. The Greens’ advantage did not last long, however, as seven minutes later, Tabone fouled Schembri in the box and the latter took the penalty himself to levelled matters for Valletta. The rest of the game was played at the same pace but the score remained unchanged. On November 24, Sliema lost 2-0 to Hibs while Melita dictated matters for long spells against Valletta but were woefully weak in front of goal. The Amateurs attacked for the whole 90 minutes but they failed to score. Then, in the closing seconds, Melita were made to pay for their carelessness as they let in a goal which handed the points to Valletta. The following week, Floriana kept pace with a 6-1 victory over St Joseph’s but Valletta soon regained top spot with a 3-2 victory over St George’s. Floriana replied with a 2-1 win over Hibernians. The league resumed on January 13, 1946, when the Greens beat their old rivals St George’s 6-1. When the Wanderers met Valletta on January 19, a victory for City would have put the champions in an unassailable position at the top of the table. However, the Blues, playing on top of their game, won 4-1. Everyone now eagerly awaited the game between Sliema and Floriana which would bring the first round to an end. A crowd of over 14,000 filled the stadium on January 27, 1946 to watch Sliema win one of the most balanced matches in the long series between the two rivals. Tony Nicholl scored the only goal of the game and at the end of the first round, Sliema enjoyed a one-point lead over Valletta and Floriana. Valletta and Sliema opened the second round with 4-0 and 6-2 victories over St George’s and St Joseph’s respectively. Both teams continued to race ahead. Valletta consolidated their position with 2-1 and 4-1 victories over Melita and St George’s. Sliema also kept up the challenge, beating St Joseph’s 7-0 and Melita 6-3. Floriana, however, lost pace with the leaders after dropping a precious point in a 0-0 draw against Hibs. Valletta and Floriana met on February 17. As one would expect, it was a tough game fought out at a furious pace. The 0-0 result favoured Sliema who had a two-point lead at the top of the standings. The Blues, however, missed a great chance to strengthen their position when, in their next game, they lost 3-2 to Hibs. A huge crowd turned up at the stadium on April 20 for the vital match between the Wanderers and Valletta. It was a match that could settle the championship even though Sliema still had to meet Floriana and Valletta had a stumbling block to surmount against Hibs. The game was full of non-stop action as Valletta set the pace in the first half and led 1-0 at half-time. In the second half, Sliema took over and equalised. Considering the importance of the occasion and the vibrant atmosphere, a draw was a fair result. Everything now depended on the last two matches. Thrills abounded in the game between Sliema and Floriana. In the first half, the Greens were all over the Blues. Faster on the ball, the Irish were always first in the tackle and, more importantly, they defended like Tigers. Leli Cauchi was the star of the match. He was a continuous menace to the Sliema defence together with centre-forward Cassar. Between them they scored the two goals that enabled the Greens to beat their rivals. This defeat cost Sliema the championship. Valletta now only needed a point from their match against Hibernians to make sure of the title. The Citizens made no mistake, beating Hibs 2-1 to retain the championship for the second year running. For Floriana it was a no-win situation. It was ironic that they wrestled the Johnnie Walker Cup out of the hands of their rivals from Sliema only to hand it to their biggest enemies from Valletta!